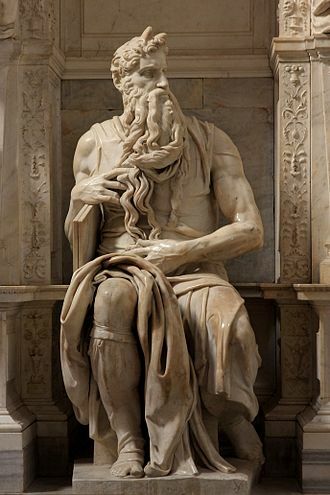 The Moses (Italian: Mosè [moˈzɛ]; c. 1513–1515) is a sculpture by the Italian High Renaissance artist Michelangelo Buonarroti, housed in the church of San Pietro in Vincoli in Rome. Commissioned in 1505 by Pope Julius II for his tomb, it depicts the biblical figure Moses with horns on his head, based on a description in chapter 34 of Exodus in the Vulgate, the Latin translation of the Bible used at that time. Pope Julius II commissioned Michelangelo to build his tomb in 1505 and it was finally completed in 1545; Julius II died in 1513 The initial design by Michelangelo was massive and called for over 40 statues. The statue of Moses would have been placed on a tier about 3.74 meters high (12 ft 3 in), opposite a figure of St. Paul. :566 In the final design, the statue of Moses sits in the center of the bottom tier. 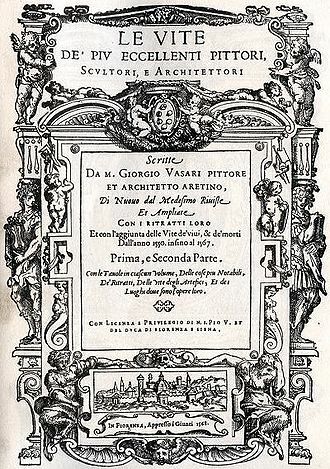 Giorgio Vasari in the Life of Michelangelo wrote: "Michelangelo finished the Moses in marble, a statue of five braccia, unequaled by any modern or ancient work. 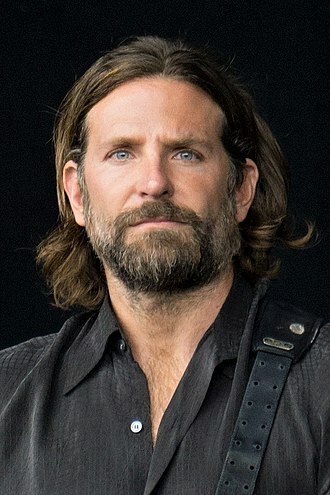 Seated in a serious attitude, he rests with one arm on the tables, and with the other holds his long glossy beard, the hairs, so difficult to render in sculpture, being so soft and downy that it seems as if the iron chisel must have become a brush. The beautiful face, like that of a saint and mighty prince, seems as one regards it to need the veil to cover it, so splendid and shining does it appear, and so well has the artist presented in the marble the divinity with which God had endowed that holy countenance. The draperies fall in graceful folds, the muscles of the arms and bones of the hands are of such beauty and perfection, as are the legs and knees, the feet were adorned with excellent shoes, that Moses may now be called the friend of God more than ever, since God has permitted his body to be prepared for the resurrection before the others by the hand of Michelangelo. The Jews still go every Saturday in troops to visit and adore it as a divine, not a human thing." The English translation of Freud's "The Moses of Michelangelo" also provides a basic description of the sculpture: "The Moses of Michelangelo is represented as seated; his body faces forward, his head with its mighty beard looks to the left, his right foot rests on the ground, and his left leg is raised so that only the toes touch the ground. His right arm links the Tables of the Law with a portion of his beard; his left arm lies in his lap." Jonathan Jones of the English newspaper, The Guardian, provides another description: "Moses's right hand protects the stone tablets bearing the Commandments; his left hand, veins throbbing, muscles tense, appears to be holding back from the violent action. 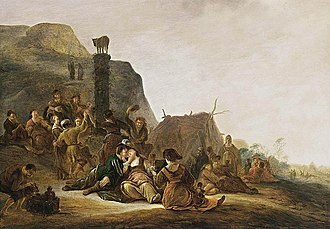 When he came down from Mount Sinai, Moses found his people worshipping the Golden Calf - the false idol they had made. His anger defies the prison of stone, the limits of the sculptor's art. Few can resist the impression of a real mind, real emotions, in the figure that glares from his marble seat. Today, he glares at the tourists who mob the church of San Pietro in Vincoli, Rome. He outfaces them, just as he outfaced Sigmund Freud, who spent three weeks in 1913 trying to figure out the sculpture's emotional effect. Moses's vitality has made this work popular since the 16th century; according to Vasari, Rome's Jewish population adopted the statue as their own. Its power must have something to do with the rendition of things that should be impossible to depict in stone; most quirkily, the beard - so ropy and smoky, its coils gave fantastic, snaking life. But where others might astonish us with technique, Michelangelo goes beyond this, leading us from formal to intellectual surprise, making us wonder why Moses fondles his beard, why Michelangelo has used this river of hair - in combination with the horns that were a conventional attribute of Moses - to give him an inhuman, demonic aspect." Detail of the statue's bicorned head. Illustration of Moses with horns from a 13th-century illuminated manuscript. Following the iconographic convention common in Latin Christianity, the statue has two horns on its head. The depiction of a horned Moses stems from the description of Moses' face as "cornuta" ("horned") in the Latin Vulgate translation of the passage found at Exodus chapter 34, specifically verses 29, 30 and 35, in which Moses returns to the people after receiving the commandments for the second time. 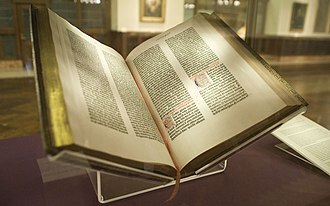 The Douay-Rheims Bible translates the Vulgate as, "And when Moses came down from the Mount Sinai, he held the two tablets of the testimony, and he knew not that his face was horned from the conversation of the Lord." This was Jerome's effort to faithfully translate the difficult, original Hebrew Masoretic text, which uses the term קָרַ֛ן, qāran (based on the root, קָ֫רֶן qeren, which often means "horn"); the term is now interpreted to mean "shining" or "emitting rays" (somewhat like a horn). Although some historians believe that Jerome made an outright error, Jerome himself appears to have seen qeren as a metaphor for "glorified", based on other commentaries he wrote, including one on Ezekiel, where he wrote that Moses' face had "become 'glorified', or as it says in the Hebrew, 'horned'. 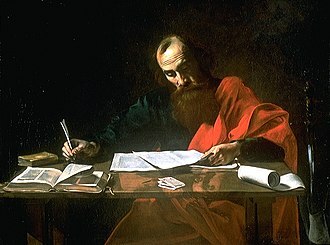 ":77:98–105 The Greek Septuagint, which Jerome also had available, translated the verse as "Moses knew not that the appearance of the skin of his face was glorified." In general medieval theologians and scholars understood that Jerome had intended to express a glorification of Moses' face, by his use of the Latin word for "horned. ":74–90 The understanding that the original Hebrew was difficult and was not likely to mean "horns" persisted into and through the Renaissance. A book published in 2008 advanced a theory that the "horns" on Michelangelo's statue were never meant to be seen and that it is wrong to interpret them as horns: "[The statue] never had horns. The artist had planned Moses as a masterpiece not only of sculpture but also of special optical effects worthy of any Hollywood movie. For this reason, the piece had to be elevated and facing straight forward, looking in the direction of the front door of the basilica. The two protrusions on the head would have been invisible to the viewer looking up from the floor below — the only thing that would have been seen was the light reflected off of them." This interpretation has been contested. We may now, I believe, permit ourselves to reap the fruits of our endeavors. We have seen how many of those who have felt the influence of this statue has been compelled to interpret it as representing Moses agitated by the spectacle of his people fallen from grace and dancing round an idol. But this interpretation had to be given up, for it made us expect to see him spring up in the next moment, break the Tables and accomplish the work of vengeance. Such a conception, however, would fail to harmonize with the design of making this figure, together with three (or five) more seated figures, a part of the tomb of Julius II. We may now take up again the abandoned interpretation, for the Moses we have reconstructed will neither leap up nor cast the Tables from him. What we see before us is not the inception of violent action but the remains of a movement that has already taken place. In his first transport of fury, Moses desired to act, to spring up and take vengeance and forget the Tables; but he has overcome the temptation, and he will now remain seated and still, in his frozen wrath and his pain mingled with contempt. Nor will he throw away the Tables so that they will break on the stones, for it is on their particular account that he has controlled his anger; it was to preserve them that he kept his passion in check. In giving way to his rage and indignation, he had to neglect the Tables, and the hand which upheld them was withdrawn. They began to slide down and were in danger of being broken. This brought him to himself. He remembered his mission and for its sake renounced an indulgence of his feelings. His hand returned and saved the unsupported Tables before they had fallen to the ground. In this attitude, he remained immobilized, and in this attitude, Michelangelo has portrayed him as the guardian of the tomb. As our eyes travel down it, the figure exhibits three distinct emotional strata. The lines of the face reflect the feelings which have won the ascendancy; the middle of the figure shows the traces of suppressed movement, and the foot still retains the attitude of the projected action. It is as though the controlling influence had proceeded downwards from above. No mention has been made so far of the left arm, and it seems to claim a share in our interpretation. The hand is laid in the lap in a mild gesture and holds as though in a caress the end of the flowing beard. It seems as if it is meant to counteract the violence with which the other hand had misused the beard a few moments ago. Another view, put forward by Malcolm MacMillan and Peter Swales in their essay entitled Observations from the Refuse-Heap: Freud, Michelangelo's Moses, and Psychoanalysis, relates the sculpture to the second set of Tables and the events mentioned in Exodus 33 and 34. 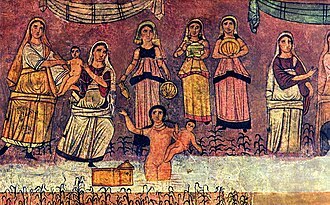 They note that Moses is holding blank tablets, which God had commanded Moses to make in preparation for the second giving of the Law; they also note that Moses is depicted with "horns," which the biblical texts describe Moses as having only after he returned to the Hebrew people after the second giving of the Law. They argue that the statue depicts the moment when Moses sees God, as described in Exodus 33: "The incident in question is the most significant part of the Old Testament story of the exodus. Moses, full of doubt about his own standing and that of his people, takes the considerable risk of requesting—even demanding—that they are forgiven, that he be granted the Lord's grace, and that the Lord resume his place and lead them to the Promised Land. Emboldened by his success, he then risks all by asking that the Lord reveal his glory. Little imagination is required to sense the intense emotion with which such a Moses would have awaited the Lord: Will he come? Will he renew the Covenant? Will he reveal his glory? ":78–79 They further argue that both Paul and Moses experienced God directly, an idea and pairing that were important to the Florentine Neo-Platonists, a group that the authors view both Michelangelo and Pope Julius II as being akin to. Finally, the authors state the key emotion on Moses' face is "awe at being face to face with the creator." ^ Colvin, Sidney (1911). "Michelangelo" . In Chisholm, Hugh. Encyclopædia Britannica. 18 (11th ed.). Cambridge University Press. p. 366. ^ a b c Sigmund Freud. The Moses of MIchelangelo The Standard Edition of the Complete Psychological Works of Sigmund Freud. Translated from the German under the general editorship of James Strachey in collaboration with Anna Freud, assisted by Alix Strachey and Alan Tyson. Volume XIII (1913-1914): Totem And Taboo and other Works. London. The Hogarth Press and The Institute Of Psycho-Analysis. 1st Edition, 1955. ^ Horny Jew: What’s the deal with Michelangelo’s Moses? Wikimedia Commons has media related to Michelangelo's Moses. Wikimedia Commons has media related to Michelangelo's grave for Julius II. For other churches of this dedication, see St Peter ad Vincula. San Pietro in Vincoli is a Roman Catholic titular church and minor basilica in Rome, best known for being the home of Michelangelos statue of Moses, the Titulus S. Petri ad vincula was assigned on 20 November 2010, to Donald Wuerl. The previous Cardinal Priest of the basilica was Pío Laghi, who died on 11 January 2009, next to the church is hosted the Faculty of Engineering of La Sapienza University, in the former convent building. This is named San Pietro in Vincoli per antonomasia, the church is located on the Oppian Hill near Cavour metro station, a short distance from the Colosseum. The Empress Eudoxia, who received them as a gift from her mother, Aelia Eudocia, consort of Valentinian II, Aelia Eudocia had received these chains as a gift from Iuvenalis, bishop of Jerusalem. According to legend, when Leo compared them to the chains of St. Peters final imprisonment in the Mamertine Prison, in Rome, the chains are now kept in a reliquary under the main altar in the basilica. The basilica, consecrated in 439 by Sixtus III, has undergone restorations, among them a restoration by Pope Adrian I. 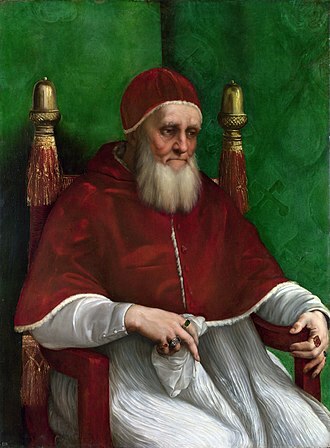 From 1471 to 1503, in which year he was elected Pope Julius II, Cardinal Della Rovere, the front portico, attributed to Baccio Pontelli, was added in 1475. The cloister has been attributed to Giuliano da Sangallo, further work was done at the beginning of the 18th century, under Francesco Fontana, and there was a renovation in 1875. The interior has a nave and two aisles, with three divided by antique Doric columns. 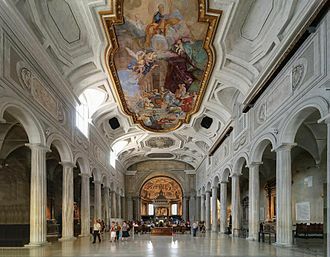 The aisles are surmounted by cross-vaults, while the nave has an 18th-century coffered ceiling, frescoed in the center by Giovanni Battista Parodi, in this scene, Pope Alexander heals the neck goiter of Saint Balbina by touching her with the chains that once bound St Peter. Moses is depicted with horns, connoting the radiance of the Lord, due to the similarity in the Hebrew words for beams of light and this kind of iconographic symbolism was common in early sacred art, and for an artist horns are easier to sculpt than rays of light. Moses is a prophet in Abrahamic religions. Also called Moshe Rabbenu in Hebrew, he is the most important prophet in Judaism and he is an important prophet in Christianity, the Baháí Faith as well as a number of other Abrahamic religions. Moses Hebrew mother, secretly hid him when the Pharaoh ordered all newborn Hebrew boys to be killed in order to reduce the population of the Israelites. Through the Pharaohs daughter, the child was adopted as a foundling from the Nile river and grew up with the Egyptian royal family. After killing an Egyptian slavemaster, Moses fled across the Red Sea to Midian, God sent Moses back to Egypt to demand the release of the Israelites from slavery. Moses said that he could not speak with assurance or eloquence, so God allowed Aaron, his brother, to become his spokesperson. After the Ten Plagues, Moses led the Exodus of the Israelites out of Egypt and across the Red Sea, after which they based themselves at Mount Sinai, after 40 years of wandering in the desert, Moses died within sight of the Promised Land on Mount Nebo. According to archaeologist William G. Rabbinical Judaism calculated a lifespan of Moses corresponding to 1391–1271 BCE, Jerome gives 1592 BCE, the Biblical account of Moses birth provides him with a folk etymology to explain the ostensible meaning of his name. He is said to have received it from the Pharaohs daughter and she named him Moses, saying, I drew him out of the water. This explanation links it to a verb mashah, meaning to draw out, the princess made a grammatical mistake which is prophetic of his future role in legend, as someone who will draw the people of Israel out of Egypt through the waters of the Red Sea. Abraham Yahuda, based on the spelling given in the Tanakh, argues that it combines water or seed and pond, expanse of water, the Hebrew etymology in the Biblical story may reflect an attempt to cancel out traces of Moses Egyptian origins. The Egyptian character of his name was recognized as such by ancient Jewish writers like Philo of Alexandria and Josephus. Philo linked Mōēsēs to the Egyptian word for water, while Josephus, in his Antiquities of the Jews, claimed that the element, -esês. 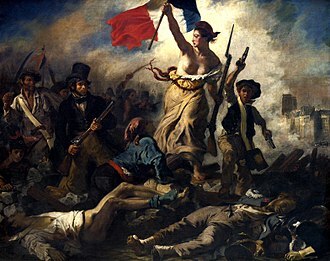 Art movements were especially important in modern art, when each consecutive movement was considered as a new avant-garde. According to theories associated with modernism and the concept of postmodernism, the period of time called modern art is posited to have changed approximately halfway through the 20th century and art made afterward is generally called contemporary art. Postmodernism in visual art begins and functions as a parallel to late modernism, the postmodern period began during late modernism, and according to some theorists postmodernism ended in the 21st century. 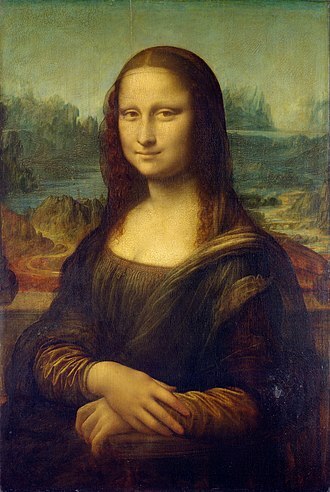 During the period of time corresponding to modern art each movement was often considered a new avant-garde. Also during the period of time referred to as modern art movement was seen corresponding to a somewhat grandiose rethinking of all that came before it. Generally there was a commonality of visual style linking the works, postmodernist theorists posit that the idea of art movements are no longer as applicable, or no longer as discernible, as the notion of art movements had been before the postmodern era. Battle of the Centaurs is a relief by Italian Renaissance artist Michelangelo, created around 1492. It was the last work Michelangelo created while under the patronage of Lorenzo de Medici, inspired by a classical relief created by Bertoldo di Giovanni, the unfinished marble sculpture depicts the mythic battle between the Lapiths and the Centaurs. A popular subject of art in ancient Greece, the story was suggested to Michelangelo by the classical scholar, Battle of the Centaurs was a remarkable sculpture in several ways, presaging Michelangelos future sculptural direction. Michelangelo had departed from the current practices of working on a discrete plane to work multidimensionally. Whether intentionally left unfinished or not, the work is significant in the tradition of non finito sculpting technique for that reason, Michelangelo regarded it as the best of his early works, and a visual reminder of why he should have focused his efforts on sculpture. Michelangelo, at 17, was working under the patronage of Lorenzo de Medici when he crafted the Battle of the Centaurs, the work reflected a current fashion for reproducing ancient themes. Specifically, Michelangelo was inspired by a relief that had produced for de Medici by Bertoldo di Giovanni. Michelangelo chose to work in marble rather than the more expensive bronze to keep down costs, Bertoldo took other liberties with his source material and seems to have himself been inspired by the Antonio del Pollaiolo engraving Battle of the Nudes. 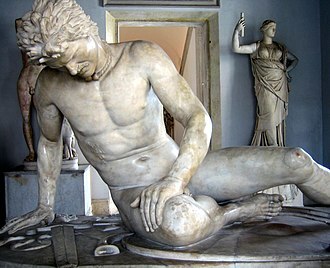 The young sculptor never finished the work and he notes that Michelangelo expressed no dissatisfaction with the work. 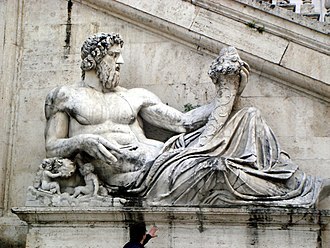 Whether or not the sculpture was left incomplete, Michelangelo regarded this sculpture as the best of his early works. According to Condivi, the poet Poliziano suggested the subject to Michelangelo. The battle depicted takes place between the Lapiths and the Centaurs at the wedding feast of Pirithous, king of the Lapith, had long clashed with the neighboring Centaurs. 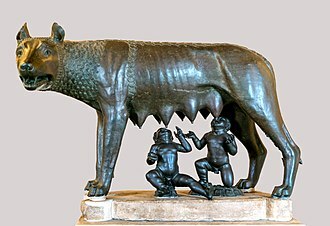 To mark his good intentions Pirithous invited the Centaurs to his wedding to Hippodamia, whose name and this led not only to an immediate clash, but to a year-long war, before the defeated Centaurs were expelled from Thessaly to the northwest. Michelangelo di Lodovico Buonarroti Simoni was an Italian sculptor, painter and poet of the High Renaissance who exerted an unparalleled influence on the development of Western art. Considered to be the greatest living artist during his lifetime, he has since described as one of the greatest artists of all time. A number of Michelangelos works of painting and architecture rank among the most famous in existence and he sculpted two of his best-known works, the Pietà and David, before the age of thirty. As an architect, Michelangelo pioneered the Mannerist style at the Laurentian Library, at the age of 74, he succeeded Antonio da Sangallo the Younger as the architect of St. Peters Basilica. Michelangelo transformed the plan so that the end was finished to his design, as was the dome, with some modification. Michelangelo was unique as the first Western artist whose biography was published while he was alive, in his lifetime he was often called Il Divino. One of the qualities most admired by his contemporaries was his terribilità, the attempts by subsequent artists to imitate Michelangelos impassioned and highly personal style resulted in Mannerism, the next major movement in Western art after the High Renaissance. Michelangelo was born on 6 March 1475 in Caprese near Arezzo, at the time of Michelangelos birth, his father was the Judicial administrator of the small town of Caprese and local administrator of Chiusi. 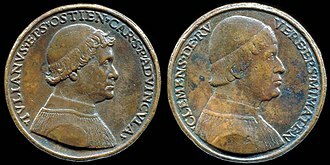 Michelangelos mother was Francesca di Neri del Miniato di Siena, the Buonarrotis claimed to descend from the Countess Mathilde of Canossa, this claim remains unproven, but Michelangelo himself believed it. Several months after Michelangelos birth, the returned to Florence. There Michelangelo gained his love for marble, as Giorgio Vasari quotes him, If there is good in me. Along with the milk of my nurse I received the knack of handling chisel and hammer, as a young boy, Michelangelo was sent to Florence to study grammar under the Humanist Francesco da Urbino. 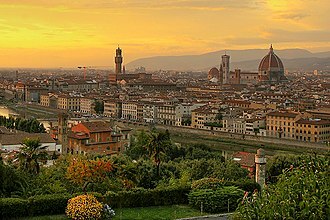 The young artist, showed no interest in his schooling, preferring to copy paintings from churches, the city of Florence was at that time the greatest centre of the arts and learning in Italy. Art was sponsored by the Signoria, by the merchant guilds and by patrons such as the Medici. The Devil is, according to Christianity, the primary opponent of God. Islam identifies the Devil with all those who oppose Allah, some non-Abrahamic religions contain figures similar to the Devil, such as the Buddhist demon Mara and the Zoroastrian spirit Angra Mainyu. The Modern English word devil descends from the Middle English devel, from Old English dēofol, that in turn represents an early Germanic borrowing of Latin diabolus. This in turn was borrowed from Ancient Greek Greek, διάβολος, from Greek, διαβάλλειν to slander, διά- across, through + βάλλειν to hurl, probably akin to the Sanskrit gurate he lifts up. In the New Testament, Satan occurs more than 30 times in passages alongside diábolos, in mainstream Judaism there is no concept of a devil as in mainstream Christianity or Islam. Texts make no direct link between the serpent that tempts Eve in the Garden of Eden in Genesis and the references to Satan are in Zechariah. For the Hasidim of the century, ha-satan was Baal Davar. In the Book of Wisdom, the devil is represented as the one who brought death into the world, a similar story is found in 1 Enoch, however, in that book, the leader of the Grigori is called Semjâzâ. 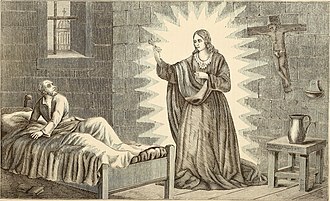 In the apocryphal literature, Satan rules over a host of angels, who induced God to test Abraham through the sacrifice of Isaac, is identical with Satan in both name and nature. The Book of Enoch contains references to Sathariel, thought to be Sataniel and Satanel, the similar spellings mirror that of his angelic brethren Michael, Raphael and Gabriel, previous to his expulsion from Heaven. In mainstream Christianity the devil is usually referred to as Satan, some modern Christians consider the devil to be an angel who, along with one-third of the angelic host rebelled against God and has consequently been condemned to the Lake of Fire. He is described as hating all humanity, opposing God, spreading lies, other modern Christians consider the devil in the Bible to refer figuratively to human sin and temptation and to any immoral human system. Satan is often identified as the serpent who convinced Eve to eat the fruit, thus. He is identified as the dragon in the Book of Revelation, beelzebub is originally the name of a Philistine god but is used in the New Testament as a synonym for Satan. The Tomb of Pope Julius II is a sculptural and architectural ensemble by Michelangelo and his assistants, originally commissioned in 1505 but not completed until 1545 on a much reduced scale. Originally intended for St. Peters Basilica, the tomb was placed in the church of San Pietro in Vincoli on the Esquiline in Rome after the popes death. This church was patronised by the della Rovere family from which Julius came, as originally conceived, the tomb would have been a colossal structure that would have given Michelangelo the room he needed for his superhuman, tragic beings. The original project called for a freestanding, three-level structure with some 40 statues, the most famous sculpture associated with the tomb is the figure of Moses, which was completed during one of the sporadic resumptions of the work in 1513. Michelangelo felt that this was his most lifelike creation, legend has it that upon its completion he struck the right knee commanding, now speak. As he felt that life was the only thing left inside the marble, there is a scar on the knee thought to be the mark of Michelangelos hammer. 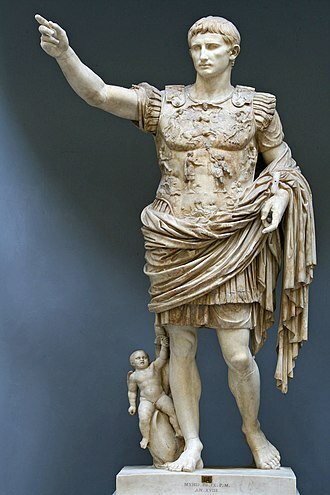 1505 – Julius commissions a tomb from Michelangelo, who spends 6 months choosing marble at Carrara,1506 – Michelanglo returns to Rome due to a lack of funds available for the project, and is dismissed by an angry and bitter Julius. 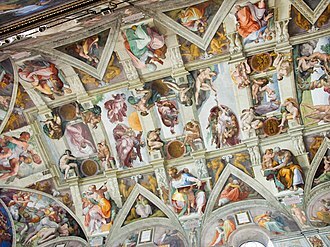 Michelangelo moves to Florence until Julius threatens to wage war on the state unless he returns,1512 – With his decoration of the Sistine Chapel ceiling complete, Michelangelo resumed work on the tomb. 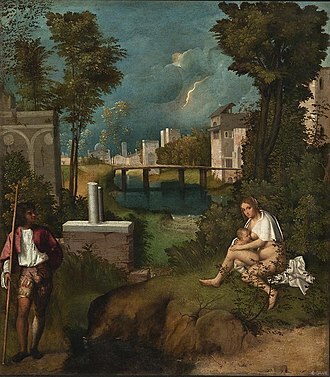 Between 1512 and 1513 he completed three sculptures for the project, the Dying and Rebellious Slaves and Moses,1513 – Julius died in February 1513. A new contract was drawn up on 6 May which specified a wall tomb, on 9 July Michelangelo contracted a stonemason, Antonio del Ponte a Sieve, to execute the architectural elements of the tombs lower register, which can be seen in the final design. 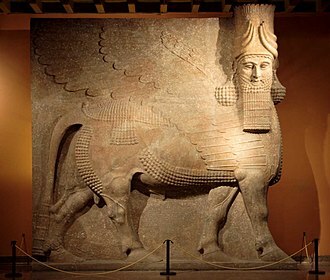 The Metropolitan Museum of Art in New York City has a drawing of the tomb from this period, though no longer for a free-standing monument, the project in fact became more ambitious both in terms of size and the complexity of its iconography. Thomas Ridgeway Gould. 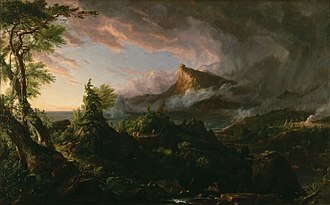 The West Wind. (profile) 1876. Moses with the Ten Commandments by Philippe de Champaigne. 18th century fresco, The Miracle of the Chains in the center of the coffered ceiling by Giovanni Battista Parodi (1706). Bramante's Tempietto, designed 1502, San Pietro in Montorio, Rome. Statue of the devil in the Žmuidzinavičius Museum or Devil's Museum in Kaunas, Lithuania. Satan (the Dragon) gives to the Beast of the sea (on the right) power represented by a sceptre in a detail of panel III.40 of the medieval French Apocalypse Tapestry, produced between 1377 and 1382. A fresco detail from the Rila Monastery, in which demons are depicted as having grotesque faces and bodies. A lion-faced deity found on a Gnostic gem in Bernard de Montfaucon's L'antiquité expliquée et représentée en figures may be a depiction of the Demiurge. 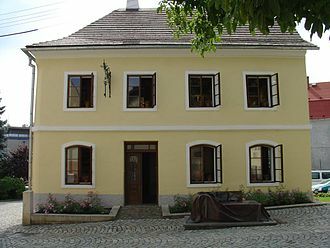 Freud's birthplace, a rented room in a locksmith's house, Freiberg, Austrian Empire, (later Příbor, Czech Republic). 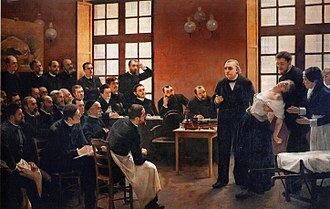 André Brouillet's 1887 A Clinical Lesson at the Salpêtrière depicting a Charcot demonstration. Freud had a lithograph of this painting placed over the couch in his consulting rooms. General view of the Arca di San Domenico. Front side of the sarcophagus. "St. Dominic resurrects the young Napoleone Orsini" (detail). Saint Jerome in his study, by Domenico Ghirlandaio. On the wall above the main entrance door of the Sistine Chapel fresco of the Prophet Zechariah lower, with the face of Pope Julius II, le below the coat of the same pope. Michelangelo. Beginning of the Letter of Aristeas to Philocrates. 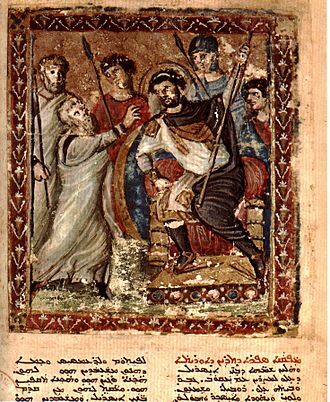 Biblioteca Apostolica Vaticana, 11th century. Allegory of Dante Alighieri, champion of the use of vernacular Italian for literature rather than the lingua franca, Latin. Fresco by Luca Signorelli in the cappella di San Brizio dome, Orvieto. an ISSN, 2049-3630, as represented by an EAN-13 bar code.